The link provided by Newsweek to corroborate these wild allegations does not contain any such information. By apparently using Google Translate, Newsweek incorrectly interpreted the term that means “to crack down” or “to take decisive measures” against criminal activities in the line of duty, translating it instead as “drastic measures” and the use of force for “drinking alcoholic beverages.” In fact, the official web portal of Ukraine’s Verkhovna Rada in English language pertaining to this legislation uses the term “decisive measures” with respect to prevention of criminal activities by the members of the military to “restore the rule of law.” The law imposes administrative responsibility for violations such as drinking alcohol (not the use of force, as RT and, in turn, Newsweek falsely claim). Article 221 allows the commander to use physical force, taking special care not to cause physical injuries or traumas, while arresting a soldier in a combat situation for the commission of crimes, including violence, threats to superiors, or unauthorized abandonment of military positions during combat missions. Weapons may be used only if there is no other way to stop soldiers engaged in serious criminal acts during combat, while taking special care not to cause the death of the soldier. With respect to deserters, Article 6 of the Disciplinary Code is amended to allow the commander to arrest any soldier for desertion or abandonment of their military unit or place of service. Going AWOL or a failure to report to duty after vacation for up to three days will cause an arrest and detention for up to 5 days. Absences without leave for three to 10 days, or several absences during the same year, will be penalized by detention for a period of 5 to 10 days. Prescribed penalties are quite different from the blatant lie disseminated by RT and Newsweek, claiming that deserters will be shot on sight. Drinking alcohol while on duty will be punishable by a fine, or arrest and detention for up to 5 days. Again, this penalty is quite different from RT’s and Newsweek’s malarkey about “drastic measures” and bogus claims that drinking alcoholic beverages will now be “punishable by force.” Incredibly, the Human Rights Watch re-published these bogus claims, disseminating them on Twitter to the organization’s 1.65 million followers with a statement: “New Ukrainian law would authorize summary execution of deserters – a clear rights violation.” Accusing the largest country in Europe of summary executions is a very serious allegation that should have been independently verified by the Human Rights Watch. This is not the first time Newsweek published blatantly false claims about Ukraine by the same writer, Damien Sharkov. The magazine previously had to issue a retraction, after Sharkov’s article, filled with completely unsubstantiated claims and innuendo, claimed that Ukrainian businessman Ihor Kolomoyskyi offered a bounty for each killed separatist. In fact, a bounty was being offered for the apprehension and arrest of the marauding lawbreakers. Nonetheless, Newsweek continues to publish Sharkov’s pieces without even minimal fact-checking, allowing him to malign Ukraine, while spreading the Kremlin’s talking points to Western readers. Russian media has been jumping through the hoops in their ongoing attempts to undermine Ukrainian mobilization. Entrapping Newsweek as its pawn to that extent is a huge score for the Kremlin’s falsehood-peddlers. It’s a victory for Russian propagandists, but a major credibility blow for Newsweek. 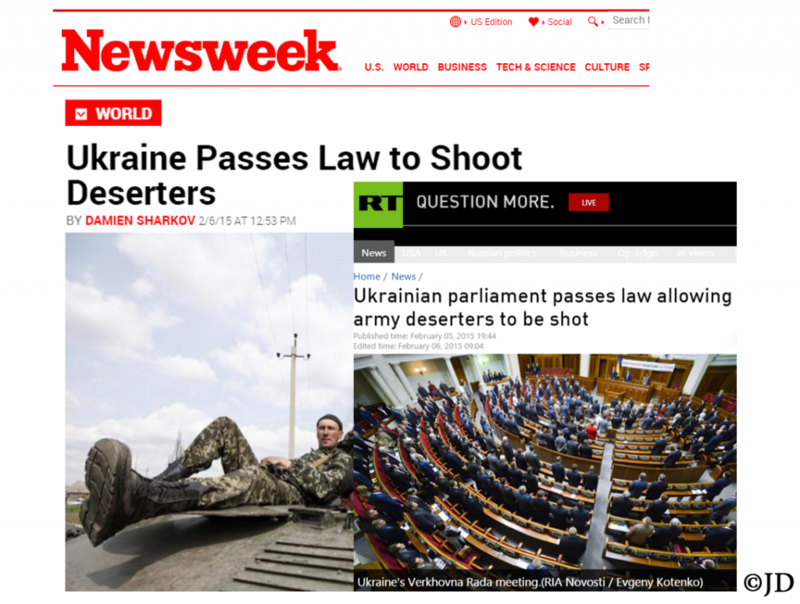 [UPDATE] Newsweek amended the article, but the headline continues to imply that under the new law, deserters would be executed, which is materially incorrect. The article also continues to refer to “drastic measures,” without any relevance to the law in question.